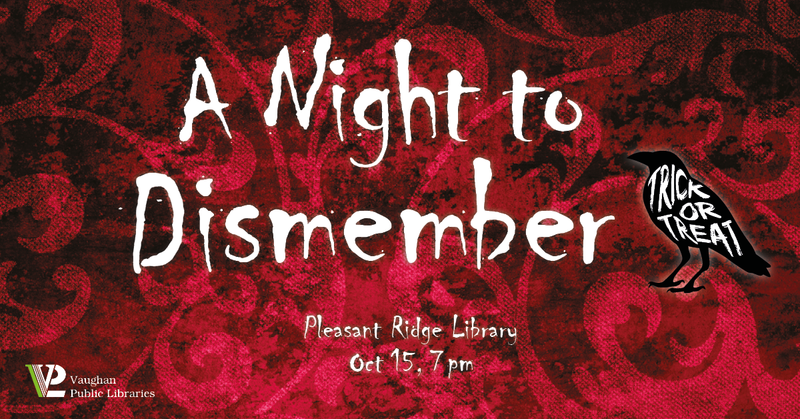 On Saturday October 15th at 7pm the Pleasant Ridge Library will be hosting A Night to Dismember. Get your “prom-posals” ready because this is like a real prom. With suits, prom dresses, corsages, dancing, but all with a bit of a zombie flare! There will be a DJ and dancing, Zombie themed activities including trivia and the Thriller dance, and at the end we will crown the zombie king and queen. Food! Did I mention food? No not just brains, we’ll have pizza, drinks and snacks. Sound awesome? Either contact the library at 905-653-7323 or email me Christine.Oosterhof@Vaughan.ca to reserve your spot. It’s FREE!